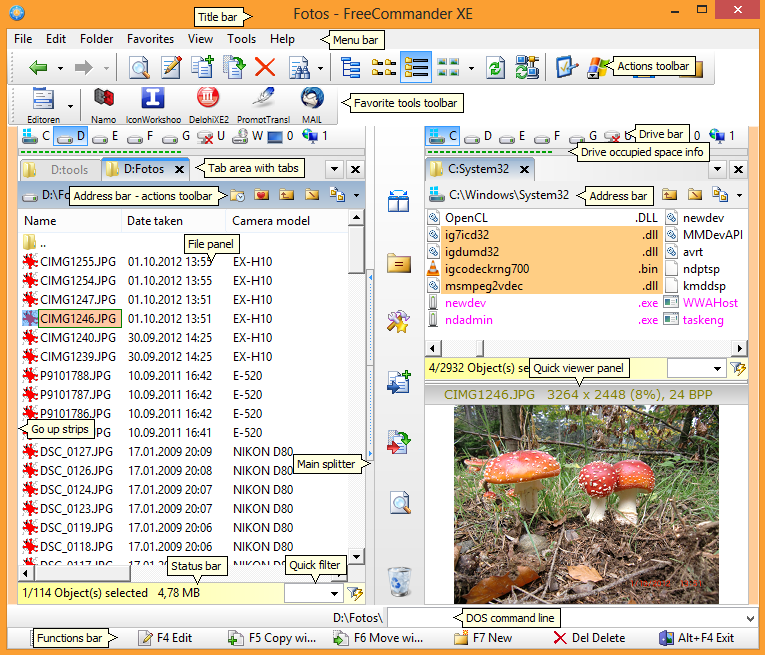 freeCommander is a dual-panel file explorer with many features. In addition to the standard file management features, it can be used to compare directories, display folder sizes, synchronize folders and more. The program can also open/create ZIp and CAB files, and open RAR files as well as search inside those archives. You can set view filters, create folder list (for printing), change file attributes, launch a command prompt, take a desktop screenshot and more. excellent tool indeed especial multi partitions and hard drive browsing and transfers Glad to see this is still being updated ! Used this for some time & is my choice of file managers, great program. The UI is good - Always 5 stars without question. Unquestionably the best. I have been using this as my default file manager for the last several years. Works just as intended. But have not seen much activity in recent times. An excellent program which is improved at every new version. No doubt one of the best. I keep using it since long ago because of its flexibility and excellent results. 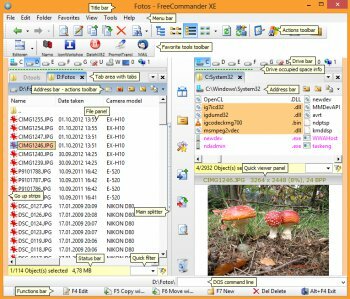 While FreeCommander might be the best non-payware OFM on Windows, it lacks the user experience of its payware compatitors. The UI looks just cheap. While not perfect, I think FC is the best out there. It's amazing how many file managers there are, and even more amazing how many shortcomings they have. Many of them simply do not work in an X64 environment, some do not work with external copy programs such as Teracopy, some have garish colors that make your eyes bleed, some have tiny tool bar icons which you can neither see nor adjust. FC is not really X64 compatible, but uses a satisfactory transparent workaround. I especially like the flexibility of FC, and I use single window and a tree (Explorer style). Personally, I think tabs make dual window file managers obsolete. You can do anything with tabs you can do with extra windows, and they're also more compact and flexible. FC tab implementation is very good, BTW. You can choose to close all non-locked tabs on closing FC, a feaure which some FM's inexplicably omit. Try it, I think you'll like it! A must have filetool, LOVE it. Bottom Line: excellent tool indeed especial multi partitions and hard drive browsing and transfers Glad to see this is still being updated ! Pros: a must have ! Over the years, I have tried just about every shell out here, including this one and Total Commander registered. It is a decent program but support and features are an issue. I found DirOpus by GPSoft, an Australian company, works like no other. DirOpus is well worth a look. Not free but gives you a 60 day trial to make sure it works for you. Support is outstanding and I have NEVER had an issue with this program. it packs all you need for managing you files. Runs fine on win 8.1 64bit. Do not listen to the trolls and idiots, there is no virus, malware or addware in this program, some people just don't have a life. I'm reviewing Free Commander Release 635. First, there is NO virus, trojans, ad ware, or anything else of a negative nature. I don't think the developer lacks much in making a full release. Everything I've tried works great. The last full version was in 2009. For some reason, they decided they needed a full on rewrite and stopped support of the 2009 version. 4 years later, it still isn't done nor is it close to feature complete. It sort of works, that is why I give it a 2, but do yourself a favor - use 2009 version or buy Total Commander instead.